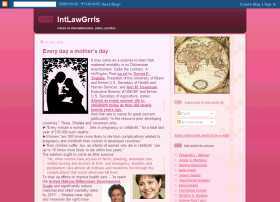 Proud to announce that IntLawGrrls once again ranks as a most-viewed law profs' blog. Following on an earlier report on which we then posted, the most recent quarterly compilations, released earlier this month by Paul L. Caron, Associate Dean and Professor at Cincinnati College of Law, place us 'Grrls 32d in page views, at 236K-plus, and 33d in unique visitors, at 141K-plus. That reflects readership increases of 36.3% and 30.9%, respectively -- 4th highest in the lists. Heartfelt thanks, as always, to all the 'Grrls who've contributed. And our heartiest thanks to all our readers. Keep on visiting us, any time!